Alfred Uhry's new play, now running at the Mark Taper Forum, focuses (as did Driving Miss Daisy before it) on the tricky, complex relationship between whites and blacks. In this case the black is Morocco Hemphill (the charismatic Laurence Fishburne), a gay drama teacher at a tony New York prep school; the white is a teenager, Anton McCormick (Matt Lanter). Anton's a problem kid who has learned to use his charm and street-smarts to maniulate people and get what he wants out of them. Morocco tries to put Anton on the right track by persuading him to play a leading role in the school play, The Prime of Miss Jean Brodie. The third person in the dramatic triangle is Lexy Sheppard (Amanda MacDonald), who is not only rich and pretty but Morocco's favorite actress, one who's used to being the object of his affection and attention. When Anton begins to usurp that role, Lexy uses her family's power and money to smear Morocco as a sexual predator. 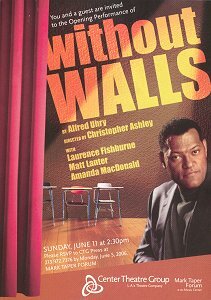 Essentially a character study, a psychological drama, WITHIN WALLS, directed by Christopher Ashley, comes off as an effective, but less-than-memorable play, one that suffers from the plaaywright's refusal to take risks, go deep.